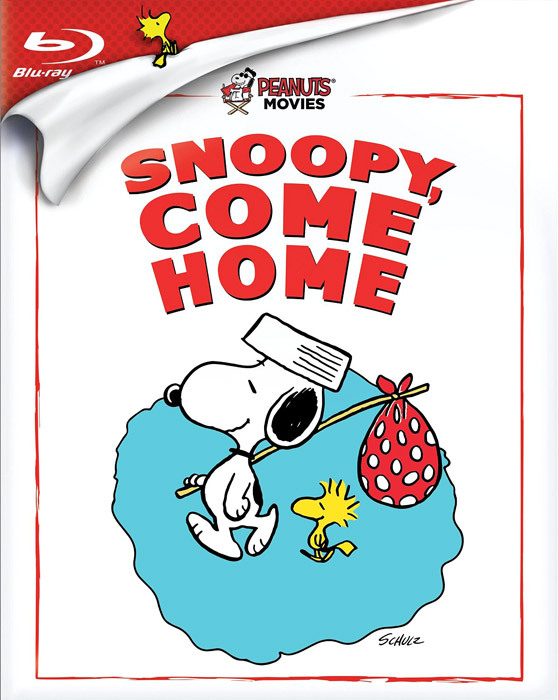 The US Blu-ray releases of the first two Peanuts theatrical films, A Boy Named Charlie Brown (1969) and Snoopy Come Home (1972), are now in stores and shipping from online retailers. It turns out that the advance information about these high-definition releases was incorrect - unlike the DVD releases of these movies, on the Blu-rays the films are presented in the 4:3 (1.33:1) aspect ratio. This is how the movies were originally animated; the widescreen aspect ratio used on the DVDs cut off the top and bottom of the picture, and resulted in a very cramped look. So this is a welcome change. Audio options on each disc are 5.1 surround (DTS-HD Master Audio) and 2.0 stereo mixes. Alas, no bonus features are included. Also worth noting is that the A Boy Named Charlie Brown Blu-ray includes the full 86-minute version of the film (as was the case with the DVD). A shortened 79-minute version had been released on VHS, Laserdisc, and was used for TV broadcasts for many years. It's good to know that when CBS/Paramount went back to master the film in high definition and 4:3, they also used the unedited version of the movie. What scene has been cut in the 79-minute version? Thanks. In the edited version, two full scenes were removed: the one where Lucy show Charle Brown an "instant replay" of him missing his kick of the football during his psychiatric appointment, and one where Charlie Brown orders room service from his hotel. Several other scenes were trimmed slightly. Fortunately both these scenes are included in the current DVD and Blu-ray releases. Wait, does this mean that the words at the top and bottom of the screen in the "I before E" sequence are no longer cut off? If so, I'm thrilled they saw the error of their moronic ways! Yes, that is correct, the top and bottoms of words in the "I Before C" song scene are no longer cut off. For example, when they sing about "yield / achieve / cashier," the word "yield" is no longer cut off at the top, and when they slide down the word "height," the top and bottom of "height" is no longer cut off. But I have seen a full-frame print of the film from the 1970's, and the words were cut off in to the left and right in the same way - so I believe having the words go slightly outside the left and right of the frame was how it was originally filmed, odd as it seems.